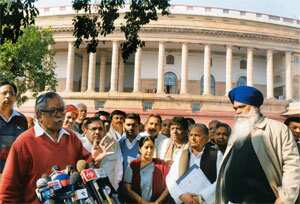 New Delhi: The Congress-led United Progressive Alliance (UPA) government rushed through five laws and introduced two Bills within 15 minutes in the Lok Sabha on Friday, bypassing all debate as its own legislators created bedlam over the Telangana issue. The move prompted the entire opposition, except the Telugu Desam Party, to stage a walkout. “It is unfortunate and it indicates an erosion in the respect for Parliament," said Subhash Kashyap, a former Lok Sabha secretary general. “In a democracy, you reach decisions through discussions. The opposition must have its say while (the) majority will have its way." This was not the first time that the UPA has passed laws without discussion. On Wednesday, three bills were cleared in the Lok Sabha within 15 minutes amid similar chaos. The government passed eight bills in 17 minutes without discussion during last year’s winter session. On Friday, the Lok Sabha was adjourned for half-an-hour at 11.30am. When it met again, the government passed the Commercial Division of High Courts Bill 2009 (to set up commercial divisions in high courts to deal with high value financial disputes on a ‘fast track’ basis); the Civil Defence (Amendment) Bill 2009 (to empower civil defence to deal with disaster management and to protect people and property in an attack); the Salaries and Allowances of Ministers (Amendment) Bill 2009 (to provide free air travel for companions or relatives of ministers); the Legal Metrology Bill 2009 (to ensure uniformity in weights and measures), and the Trade Marks (Amendment) Bill 2009 (to simplify the trademark registration process). In a joint news conference outside the house, the Bharatiya Janata Party, the Left parties, the Samajwadi Party and the Janata Dal-United said the uproar over Telangana was a Congress “conspiracy" to pass bills without allowing the opposition to speak. In her concluding remarks, Speaker Meira Kumar said the Lok Sabha had lost 31 hours and 49 minutes due to the disruptions.